On this National Democracy day, three days from the 2018 Nigerian Symposium for Young and Emerging Leaders organized by The Future Project, we are forced to look back at the governments we have had since we left behind 40 years of dictatorships and embraced democracy. It took nearly two decades to manage our first internationally lauded free and fair election, and our first peaceful, democratic handover between presidents. But those events seem like bookends for governments that are riddled with bureaucracy, corruption and a disregard for the rule of law. There have been instances of such complete disintegration of government process that citizen activists have had to step into the fray and hold the government accountable. Yemi Adamolekun, executive director of Enough is Enough has been one of the citizen activists in the trenches, acting as a watchdog for process transparency spanning several governments. As an activist, her pedigree is unmatched. She has seen government abandon election manifestos, and renege on campaign promises. She was at the forefront of the groundbreaking #OccupyNigeria protest, and continues to challenge government to keep its processes transparent. 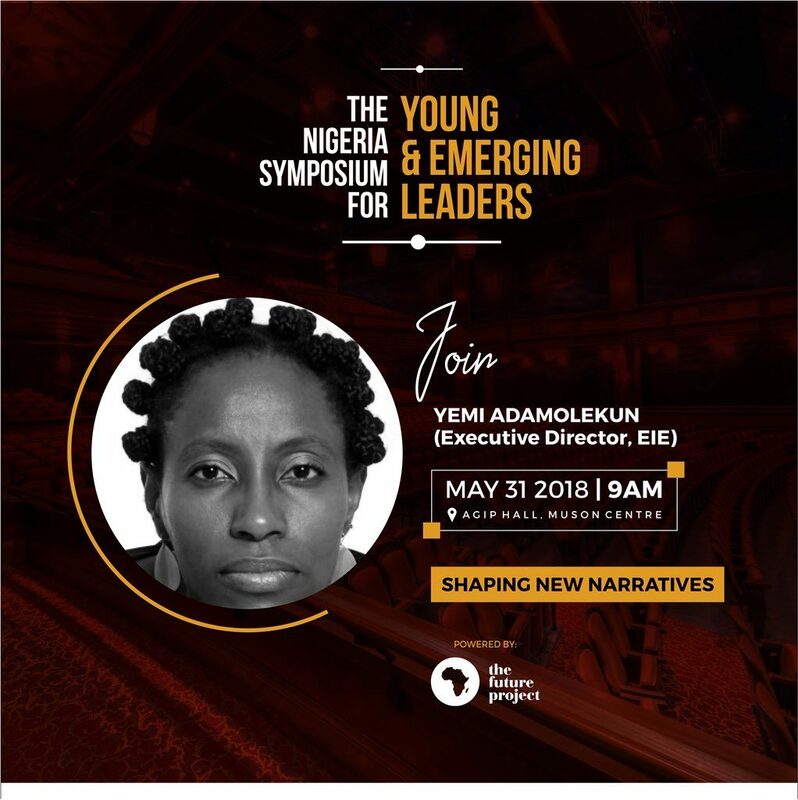 As the moderator of The Future Project’s Nigeria Symposium for Young and Emerging Leaders, I am curious to see where she takes the panelists who are coming to intimate us with the government’s attempts at correcting the mistakes of government’s past and restructure the process to improve on its transparency and its focus on citizenship. Especially now that President Buhari has promised to sign the #NotTooYoungToRun bill before next year’s elections, opening up the playing field for a new generation of politicians with new ideas. She already has some of the young politicians already making an impact in their fields, like Mark Okoye, a former recipient of The Future Awards Africa’s Person of the Year award in 2016 for his excellent work in public service, working as the Anambra state commissioner for Economic Planning and Budget Development, the youngest commissioner in the history of Nigeria at the time of his appointment. Okoye has been very hands-on in community development and it will be interesting to see into the mechanism that runs Willie Obiano’s highly lauded government. It will be interesting to see Yemi Adamolekun spar with Asuquo Ekpenyong, who used to hold the title for youngest commissioner in the history of Nigeria before Okoye. He will bring his unique perspective of working in a government plagued by insecurity, pollution and a Federal allocation budget that seems eternally mired in political intrigue. Ekpenyong brings expertise in academia, a background in finance and political experience to panel, providing a good counterweight to Okoye and Muhammed Sani Datiijo, the Kaduna state commissioner for Budget and Planning. Dattijo is part of Mallam Nasir El-Rufai’s controversial government style, which has been praised for its decisive action but also criticized for its heavy handed approach to dissent and criticism. His governor Mallam El-Rufai is heavily distrusted for comments that could be misconstrued as ethnically biased and his reluctance to wade into the Fulani Herdsmen crisis in the majority Christian Southern Kaduna. All three commissioners bring unique perspectives to the panel, but as an outsider running Paradigm Initiative, the citizen activism platform, Gbenga Sesan has the unique perspective of seeing how even the government’s most well meaning initiatives actually play out in the polity. He will bringing that to the panel, and providing data based insight on how transparency or the lack of it strengthens or weakens our government. It isn’t too late to register for the symposium. Do it here.